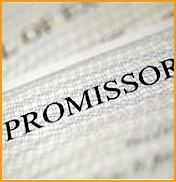 A Promissory note is an agreement that you have promised to repay the loan you have borrowed from a mortgage broker or some one. The agreement is a promise to payback the lender the required sum of money at the pre-agreed interest rate. The lender must keep the original copy of note, however it is essential for the borrower to posses a duplicate copy of the document. It is essential to review and carefully examine the document before agreeing upon the terms. The promissory note ideally consists of principal amount, interest rate, late charge and default provisions and payment terms. The form however can be modified to include instalment payments. The promissory notes are generally payable upon demand. If a company issues a promissory note in Nevada then the note must contain the address of its Nevada office and it is interpreted in accordance with the internal laws of the state of Nevada. The buyers of a promissory note issued by a foreign company must ensure whether the company is authorized to perform its business activities in the state of Nevada.